When you see the blossoms on the flowering plum tree, you know spring has finally arrived! All the flowering trees on our list, with the exception of the Chitalpa, are spring bloomers. The dwarf flowering Purple Pony is an excellent solution for small landscape areas. The tree is only ten to twelve feet tall. The pale, single pink blooms are followed by purplish foliage, adding interest from spring to fall. 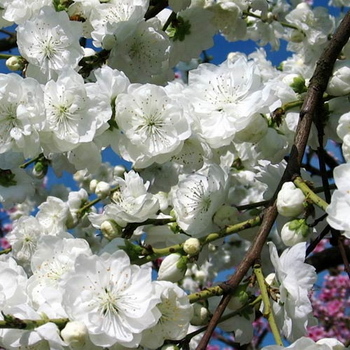 Flowering plum trees are very low maintenance plants that need minimal pruning. They have few disease and insect problems except in the Pacific Northwest where leaf damage from insects and fungus can be a problem. They are not particular about soil, but cannot survive in boggy situations. Crabapples are hardier and more tolerant of wet soils than stone fruits. They tolerate heat and need be pruned only for aesthetic purposes. They make good espaliers (see our tips on espaliering in the Gardening Guide). Transcendent is a variety that produces edible fruit, generally used for preserves and jellies. The fruit can be used alone for jelly or with other fruits that contain less pectin. It’s also an excellent pollenizer. Flowering peaches are identical to fruiting peaches in growth habit, height and cultural requirements. Heavy pruning is necessary for a good show of flowers. Prune after bloom or you can cut the flowering stems for bouquets as a method of pruning. Early flowering varieties are best for areas with early and hot springs. The early pink and red flowering varieties are popular for the Chinese New Year in southern California because of their very early bloom. Double Jewel, Red Baron and Saturn bear fruit in addition to their very showy flowers. Flowering cherries are spectacular! They perform best in well-drained soil as do their fruiting counterparts. They are well-suited to Oriental gardens and are a focal point for many landscapes in Japan. They vary in form from the narrow Amanagawa to the Yoshino, a rounded tree forty feet tall and thirty feet wide. The flowers bloom in white and shades of pink with glossy, dark green leaves. The Chitalpa differs from our other ornamental trees in that it blooms in the summer with light pink flowers that resemble orchid blooms. The tree is relatively small, reaching twenty to thirty feet. This cross of the Catalpa tree and the Chilopsis shrub was originally hybridized in Uzbekistan. The Chitalpa can withstand heat and drought and has been known to withstand temperatures of nine degrees. In USDA Zone 6, it will freeze to the ground. The Chitalpa can be grown as a standard although it has a tendency to sucker. Left to its natural inclinations, it makes a lovely multi-trunked tree. An excellent, heavy bearing crabapple for preserves and jellies. Large fruit is up to 2" wide, yellow with pink or red blush, to almost entirely red. Creamy yellow flesh is crisp, juicy and tart. Medium sized tree produces consistent crops in most areas except the high desert and coastal areas of southern California. Ripens August to September. 500 hours or less. Self-fruitful. Available on Apple. Apricot used for pickling and ornamental bloom. Single white flowers with spicy fragrance bloom from late January to early February. Fruit is 3/4 to 1" in diameter and ripens in mid May. 250 hours. Self-fruitful. Available on Myro. Upright growth to 30 x 20 ft. Spectacular large, double rosy pink flowers in drooping clusters, mid season, with long blooming period. Flowers appear before or with young red leaves. Available on Mazz. Early blooming with semi-double white flowers emerging from pink buds. Strong horizontal branching. Striking yellow-orange foliage in autumn. To 20 feet by 25 feet. Available on: Mazz. Latest flowering cherry to bloom. Spectacular, abundant, double flowers, pink aging to white. Long stemmed, drooping. Beautiful dark green foliage. Spreading tree to 25 ft. high. Early display of light pink to white, fragrant, single blossoms. Fast growth to 40 ft. x 30 ft. Rounded, open canopy with graceful, curving branches. LIght gray bark. Glossy, bright green foliage. (Chitalpa tashkentensis "Pink Dawn") A cross between Catalpa and Chilopsis. Fast growing tree 20-30 ft. and almost as wide. Has bright green 4-5" long leaves and profuse clusters of frilly light pink flowers. Blooms over long period, late spring through summer. Tolerant of heat, drought and full sun. Fast growth to 20 x 20 ft. with spectacular, large, snow white double blossoms. Available on Lov. Fast growth to 20 x 20 ft. with vivid purplish red flowers. Blooms very early. Used in southern California for Chinese New Year. Has small, sweet, light green skinned fruit. Available on Lov. To 20 x 20 ft. with magnificent double red flowers. Late bloom; good for frost-prone areas or to follow early bloomers. Available on Lov. To 20 x 20 ft. Double flowers are variegated - red, pink and white striped; very showy and unusual. Blooms mid season. Available on Lov. Outstanding purple foliage with single pale pink blooms. Tree grows ten to twelve feet tall. Sterile. Zones 5-10. Flowering and fruiting peach for home orchard and landscape. Has highly ornamental, late, profuse and showy double pink flowers. Large yellow freestone fruit has sweet, rich flavor; keeps well. Ripens in late June/early July. 3-400 hrs. Self-fruitful. Pat. No. 6410 (Zaiger). Available on Cit. Flowering and fruiting peach variety. Highly ornamental with very showy, double red blossoms which cover the tree in early spring. Yellow freestone fruit is large, firm, sweet, juicy and richly flavored. Longtime favorite in southern California. Ripens in mid July to mid August. Low chilling requirement, 250-300 hrs. Self-fruitful. Pat. No. 4195. Available on Nema. Flowering and fruiting peach variety. Highly ornamental with very showy, double red blossoms which cover the tree in early spring. Yellow freestone fruit is large, firm, sweet, juicy and richly flavored. Longtime favorite in southern California. Ripens in mid July to mid August. Low chilling requirement, 250-300 hrs. Self-fruitful. Pat. No. 4195. Available on Cit. Fruiting and flowering variety. Large yellow freestone peach with juicy, sweet, low acid, fine flavored flesh. Prolific bloom with spectacular, large, double dark pink blossoms. Ripens mid July. 250-300 hrs. Self-fruitful. Available on Cit.